August 11, 1977 – The Chicago Plan Commission votes down a proposed four billion-dollar development proposed for land between the south Loop and the east side of the Chicago River. 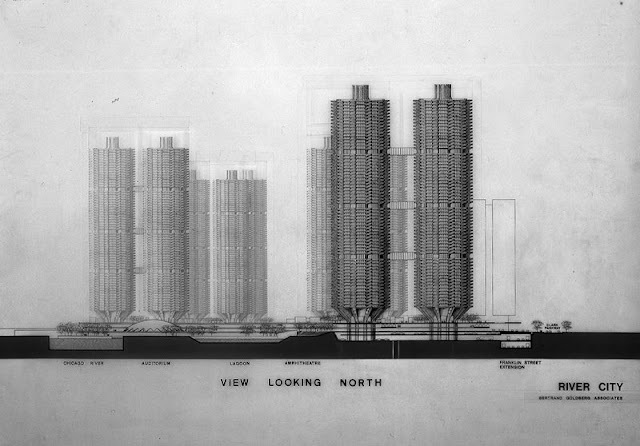 The project, a Bertrand Goldberg design for six 72-story towers and 6,000 apartments, is proposed for a 45-acre site bounded by Harrison Street, Roosevelt Road, the Chicago River and Wells Street. Lewis J. Hill, the city commissioner of development and planning, asserts that city guidelines recommend 1,750 units on the site, and the Goldberg plan far exceeds those guidelines. “In short,” Hill says, “the River City plan proposes development that is three to five times more intense than that recommended in the guidelines.” [Chicago Tribune, August 12, 1977] Hill also says that the huge project would also stand in the way of the proposed Franklin Street Connector that is planned to link the Dan Ryan Expressway with Wacker Drive. Forty years later River Line, a project involving ten high-rise residential buildings lining the banks of the river, is underway, with Perkins and Will responsible for siting the massive project to the north and south of the current River City, a 1986 community of about 440 units, the scaled-down design that eventually came out of Bertrand Goldberg’s 1970’s proposal. 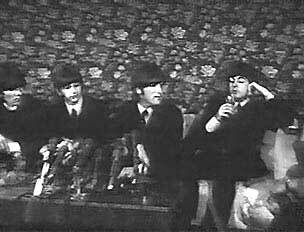 August 11, 1966 – The Beatles arrive in Chicago in the middle of a swirling controversy, and John Lennon, in a press conference at the Astor Towers Hotel, apologizes for his part in creating the furor that developed after his casual remark that the Beatles were more popular than Jesus. “I wasn’t saying whatever they say I was saying,” says Lennon, described by the Tribune as a “Shaggy-haired Liverpool performer.” [Chicago Tribune, August 11, 1966] “I‘m sorry I said it really. I never meant it to be a lousy anti-religious thing. I apologize if that will make you happy. I still don’t know quite what I’ve done. I’ve tried to tell you what I did do but if you want me to apologize, if that will make you happy, then OK, I’m sorry.” For a personal essay on the event and how it has stayed with me for fifty years, you may want to look up this blog entry from 2009. Information concerning Astor Towers, where the press conference took place, may be found here.